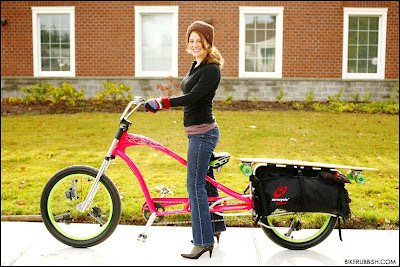 Derek, in Washington State, USA, is always kind enough to share his photos from BikeRubbish.com with us. After the previous post featuring photos of my Wifealiciousness, it's only appropriate that we feature this photo of Derek's Wifealiciousness - although he's not allowed to use that copyrighted name :-) - entitled "Grocery run with my sweet, sweet wife." See some of Derek's previous shots on this blog with the 'bikerubbish' tag.